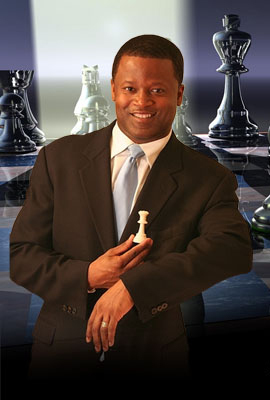 On Thursday afternoon (November 10th), celebrated international Chess Grandmaster Maurice Ashley (the first black man to achieve the coveted title) arrived in Jamaica on the 4th leg of his Caribbean tour, having already visited Guadeloupe, Martinique and the US. Virgin Islands. One of Chess’s most recognizable figures, Ashley was accorded a VIP welcome by the authorities at Jamaica’s Norman Manley International Airport and spent time in the VIP lounge on his arrival “holding court”! Ashley is in Jamaica as the special guest of the Magnificent Chess Foundation (“MCF”) for the launch of the MCF’s headquarters at 10 Swallowfield Road, Kingston 5 on Friday November 11 (5:00 pm). He will speak briefly at the ceremony on the applicability of chess to life after which he will give a simultaneously exhibition on thirty (30) boards. A number of dignitaries including the Honorable Delroy Chuck, Jamaica’s Minister of Justice and chess aficionado, and the Honorable Ransford Braham, QC, the Attorney-General of Jamaica, are expected to be in attendance. All are invited to attend this historic event. Persons interested in participating in the “simul” are asked to register at the MCF’s office where additional information is available. During his brief stay in Jamaica Ashley will be interviewed by various media houses and film maker Justine Henzell (daughter of Perry Henzell of “The Harder they Come” fame) for a documentary to be released commemorating Jamaica’s 50th year of Independence. His itinerary also includes making a courtesy call on Jamaica’s Minister of Sports and visiting the parish of St. Ann the site of, inter alia, the famous Dunn’s River Falls and Discovery Bay where the Spaniard Christopher Columbus landed. Ashley departs Jamaica on Sunday, November 13 for the Bahamas before completing his Caribbean tour in Belize.